About one in seven people experience the slowed, stiff, jerky, or excessive motions that characterize the neurological conditions known as movement disorders. For many, movement disorders cause chronic pain, weakness, and disability and make employment and independent living difficult or impossible. Although most movement disorders cannot be cured, patients who get timely diagnoses and educate themselves about medications, surgeries, and therapies may find relief of painful symptoms and face fewer limitations. 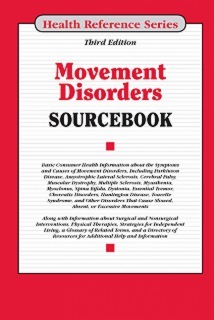 Movement Disorders Sourcebook, Third Edition provides information about the common types and symptoms of movement disorders in children and adults. The Sourcebook details the causes and treatments of Parkinson disease and provides information on other hypokinetic movement disorders, such as amyotrophic lateral sclerosis, cerebral palsy, muscular dystrophy, multiple sclerosis, myasthenia, myoclonus, spina bifida, and spinal cord injury. Basic facts about hyperkinetic movement disorders, including dystonia, essential tremor, choreatic disorders, Huntington disease, and movement disorders during sleep, and Tourette syndrome, are provided. In addition, the book offers information about surgical and nonsurgical treatments, physical therapies, strategies for independent living, and tips for spouses, caregivers, and parents of people with movement disorders. The volume concludes with a glossary of related terms and a directory of resources. Part I: Introduction to Movement Disorders provides general information about how the brain, bones, muscles, and joints contribute to the body’s movement. This part also offers an overview of some of the most common types of movement disorders and their related symptoms, including ataxia, spasticity, stiffness, cramps, twitching, and tremor. Part II: Parkinson Disease offers detailed facts on the causes, symptoms, and progression of this well-known movement disorder and its related syndromes. Information on PD therapies and treatments as well as strategies for coping with pain, nutrition, relationships, and employment concerns are also discussed. Part III: Other Hypokinetic Movement Disorders: Slowed or Absent Movements identifies the symptoms and treatments for hypokinetic movement disorders, including amyotrophic lateral sclerosis, cerebellar or spinocerebellar degeneration, cerebral palsy, muscular dystrophy, multiple sclerosis, myasthenia, myoclonus, spina bifida, and spinal cord injury. Part IV: Hyperkinetic Movement Disorders: Excessive or Unwanted Movements explains the basics of hyperkinetic disorders, such as dystonia, tremor disorders, chorea, Huntington disease, restless legs syndrome and periodic limb movement disorders, neuroacanthocytosis and neurodegeneration, spastic paraplegia, and Tourette syndrome. Part V: Diagnosis and Treatment of Movement Disorders highlights specific tests and procedures used to diagnose movement disorders and offers patients advice on assembling a trusted health care team. Current therapies used to treat the symptoms of movement disorders—including botulinum toxin injections, surgical options, medications, and physical therapy—are also discussed, as is the future potential of stem cell therapy for reducing the pain and disability associated with movement disorders. Part VI: Living with Movement Disorders identifies the everyday concerns of people with movement disorders and their caregivers. Tips on choosing health care facilities, assembling legal documents, dressing, driving, working independently, coping with chronic illness, and supporting and parenting a loved one with a movement disorder are all included in this part. Part VII: Additional Help and Information includes a glossary of important terms and a directory of organizations for patients with movement disorders and their families.